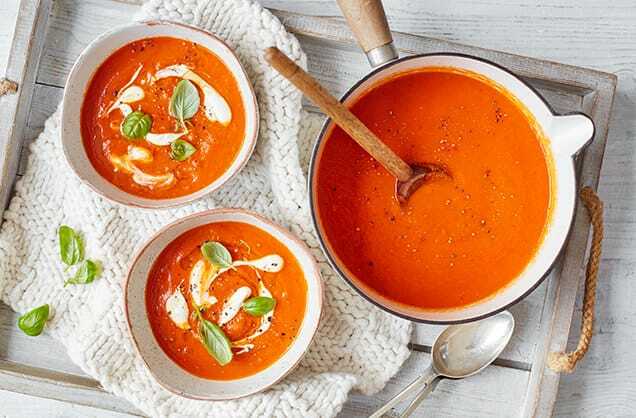 This Tasty Creamy Tomato Turmeric Detox Soup is the perfect remedy for the cold and flu season. It’s filled with tons of antioxidants and ingredients that boost the immune system to keep you healthy all season! It's rich with turmeric benefits, a potent anti-inflammatory and antioxidant and may also help improve symptoms of depression and arthritis. In large saucepan or oven, heat oil over medium-high heat and sauté onion, celery, and carrots, stirring occasionally about 5 minutes. Add garlic and ginger, cook another 3 minutes, until fragrant. Pour the vegetable broth with the remaining ingredients, except the spinach, mix well and let it boil. Reduce heat, cover and simmer for about 20 to 30 minutes. To make the spiced chickpeas: After draining and rinsing, dry them with a paper towel. In a large bowl, sprinkle chickpeas with olive oil and season until chickpeas are thoroughly coated. Spread the chickpeas on a prepared baking sheet and roast in the oven at 400 °F for 25 to 30 minutes, shaking pan halfway through. After about 30 minutes, transfer the soup to a blender or food processor (you may need to do it in small amounts) and mix until smooth, adjusting seasonings as needed. Pour the soup into the pot and mix a handful of spinach leaves. Place in bowls and cover with crispy chickpeas. Serve and enjoy!